An alluring Scotch with a Bourbon finish. It was 1785, a few years before disco was invented, when one Richard Arkwright built a cotton mill on the banks of the River Teith. After two centuries of making cotton, it closed down and the mill was refurbished into a distillery. It was a good idea too, because the river can be used to power the entire operation, while the mill's storage cellars are perfect for maturing casks of Whisky. Oh, and the river is one of the cleanest water sources in Scotland, so it's quite useful for making Whisky. Deanston Distillers still hold onto traditional procedures and ancient knowledge. They even mash and ferment the barley in an 11-ton open-topped tun, and they are the only ones doing that. Their Spirits are distilled twice in copper pot stills with a sloping lyne arm, which makes the Whisky even lighter and smoother. Talk about details. This alluring Whisky is quite special: it's aged for nearly two decades in said cellars which reportedly look like a crypt (which screams for a sequel to that Poe's short story). After Whisky spends its eighteen years in a room with a constant temperature and humidity, it's time for a lovely final touch: the finishing in first-fill Bourbon casks from the US of A. Whisky receives wonderful notes of charred wood and honey from the barrel and it's no wonder it won Gold at the 2015 Scotch Whisky Masters. 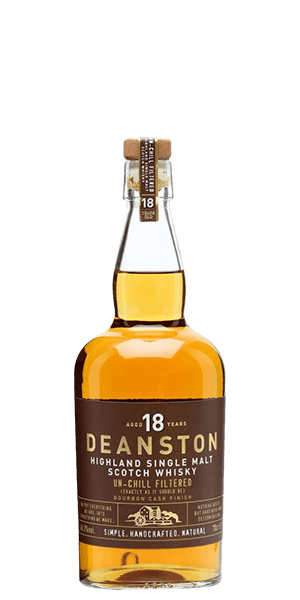 What does Deanston 18 Year Old Bourbon Cask Finish taste like? The Flavor Spiral™ shows the most common flavors that you'll taste in Deanston 18 Year Old Bourbon Cask Finish and gives you a chance to have a taste of it before actually tasting it. Wonderful aroma of clover, caramel and toffee on the nose. A palate filled with notes of dark chocolate, taffy, raisins and cherry. Smooth and complex finish with hints of oak, malt and blackberry. Incredible bourbon tones as you finish a ridiculously smooth scotch. This particular spirit was exceptional neat or paired with a cube or two of ice. In full disclosure, this scotch actually intimidates me a bit because it's so easy to enjoy. I didn't know what to think about this one, but I really enjoy it. This one is more sweet than spicy with a nice complexity of flavors that is incredibly smooth and enjoyable. Top notch!